In 2017 we planted a further 80 hectares of the 404 hectare ‘Kwobrup Downs’ restoration site purchased in 2010, creating a bigger and better carbon sink. Situated at Badgebup, 45kms east of Katanning, the property sits within the lower drainage zone of the local catchment, and is subsequently subjected to both flooding and salinity. Large areas of the site have already become saline and only support the most salt tolerant species found in Western Australia. The July 2017 planting brings the total area planted on the property to 220 hectares. It covered 34 hectares of cleared land on the eastern side of the site, suited to a mixed Eucalyptus wandoo and Acacia acuminata and a further 46 hectares of pasture land present in the Mallee Belt paddock planted to Eucalypt woodland system. Seed collection was done on site and included 53 species which have successfully established from previous revegetation works. Eighty hectares were direct seeding covered a range of Acacia, Eucalyptus Melaleuca species. Seeds were dried and some hard-coated species (eg Acacia) pre-treated to to break dormancy. 53 species of trees and shrubs were direct seeded. To do this the planter is modified to plant seedlings and they seeds are planted inbetween. This is a highly specialised practise, and when done well much cost effective than planting seedlings for broadscale revegetation. 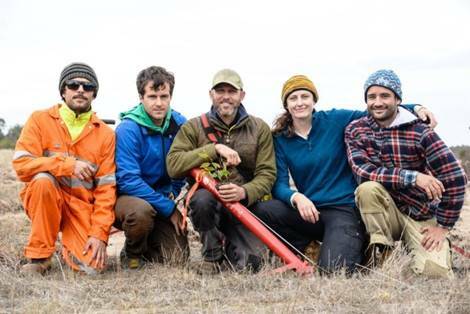 We used the experience of Justin Jonson and his team from Threshold Environmental, whom we have worked with on previous planting projects at Moresby Ranges. Direct sowing of is also more robust establishment method and from a restoration viewpoint delivers higher plant densities and better structural diversity of species than planting seedlings. The success of this planting site may not be known until the third year after planting. Remedial works may be needed to strengthen the carbon sequestration potential with in-fill planting to increase the main carbon species across the site. In some sections, thinning of excessive numbers of recruits may be required. Check out our short film about the project here it has some great drone footage of the area.